Front of '61 Buick Special aluminum V8, showing accessible location of distributor, water pump and oil filter. This engine weights only 320 pounds with all accessories, develops 155 hp from 215 cubic inches. Many enthusiasts don't realize that this new 300-cubic inch Buick engine is the same basic engine as the little 215 cubic inch aluminum V8 that was introduced three years ago. But it has the same bore center spacing, most of the machining dimensions are the same, and many of the aluminum parts for the original engine have been retained with the cast manifold, water pump, front engine cover (in unit with pump), some accessories, etc. 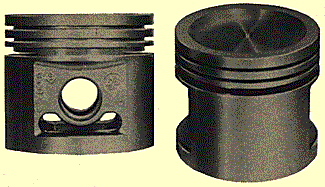 The main points of difference are the new cast iron block itself (with higher deck height to allow for the longer stroke), new cast malleable iron crankshaft with longer stroke and larger main bearing journals, longer connecting rods, larger pistons, larger intake valves and ports, and necessary differences in balance, timing, etc. to allow for the displacement change. Otherwise these two engines are the same breed. LEFT-- Buick-Olds aluminum V8's had iron cylinder sleeves cast right into cast blocking. 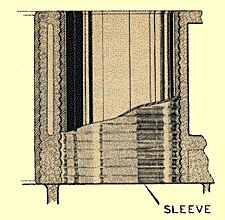 Sleeves were fluted with ridges to help lock them solidly in place. Construction of this engine proved expensive. 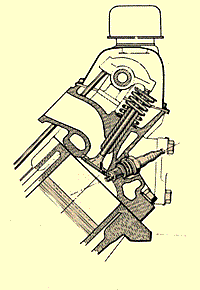 RIGHT-- Buick aluminum V8 used dish-top pistons to give unusual oval-shaped combustion chamber -- with valves moved inward toward cylinder center and spark plug placed near center of the chamber. The new 300-cubic-inch Buick iron-block version weighs 84 pounds more - which would put it just over 400 pounds. This is still the lowest weight per cubic in of any iron-block engine in the industry. The secret, of course, is in the aluminum heads and intake manifold. I want to emphasize that this new Buick 300 engine is still and extremely light and compact engine - even with the new iron block. It should be useable almost interchangeability win applications where the all-aluminum engine was use before. The overall width is about on inch more because of the raised block; this would raise the height slightly, too - but length would remain virtually the same. 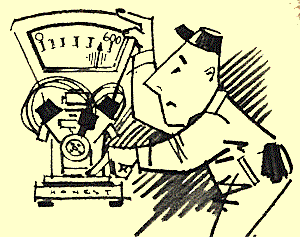 The 84 pounds increase in weight will not kill an installation in many cases. 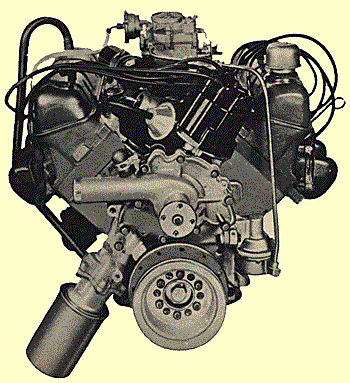 I see this basic Buick iron-aluminum V8 engine as on of the most promising in the field for the real lightweight car. It weighs at least 50 pounds less than anything else available in a V8, and stripped competition versions of the aluminum job can go well under 300 pounds without starter, generator, etc. At the same time the external dimensions are as compact as the best of 'em. The original 215-cubic-inch aluminum jobs will fit in places no other American V-8 will go. How about the performance potential? Obviously it's too early to know much about the new 300-cubic-inch iron version. It's only been on the street a few days as this is written. But the 215-cubic-inch aluminum engines showed quite a lot - so there is no reason to believe the bigger version couldn't get almost as much horsepower and torque per cubic inch. (Though it theoretically shouldn't be as high for reasons discussed earlier.) Speaking of the original 215, the Edelbrock Equipment Company makers of manifolds and other speed equipment, ran an interesting series of dynamometer tests on both the Buick and Olds versions in early 1961 to check this performance potential with various modifications. They stuck with the original bore and stroke; but eventually ended up with special dual-carb intake manifolds with Chevy two-throat carbs, 12-to-1 compression ratio, Isky E-2 cam with solid lifters, Spalding dual-coil ignition, and Hedman exhaust headers. In this form both engines peaked their horsepower at 6500 rpm - but the Buick gave 10 hp more than the Olds at this speed, with a peak of 233 hp. 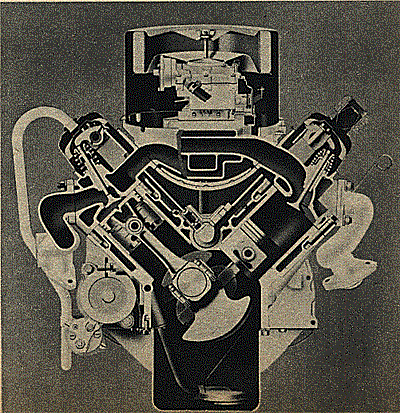 The Buick heads had been ported slightly, which may have made the difference. But numerous road tests on both engines with exactly similar equipment indicated that the oval-shaped Buick combustion chambers put out a little more horsepower that the more conventional Olds wedge-shaped chambers. Apparently the chamber walls gave less breathing restriction around the edges of the valves. As a result most builders of high-performance cars using this basic 215-cubic-inch aluminum engine have chosen the Buick version. You'll recall that Mickey Thompson claimed 330 hp at 6500 rpm on straight alcohol fuel for his 255-cubi-inch Indianapolis engines in 1962. He used Buick engine. It's hard to judge from the track performance of the cars whether he was actually getting this power or not; but that's what the dyno said. It's not hard to believe. Comparison of Olds F85 version, right, and small Buick aluminum V8, left. 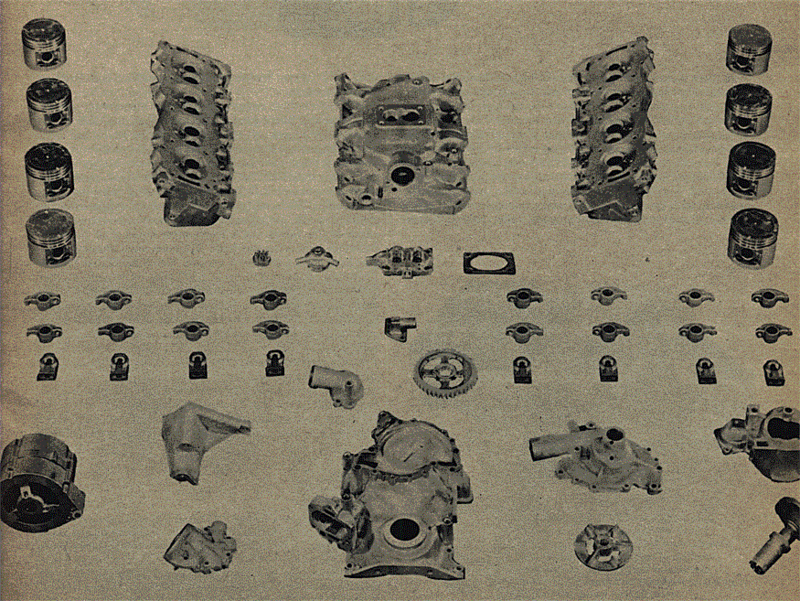 Olds had slighly different cylinder heads with wedge-type combustion chambers. It developed a few hp less than Buick. 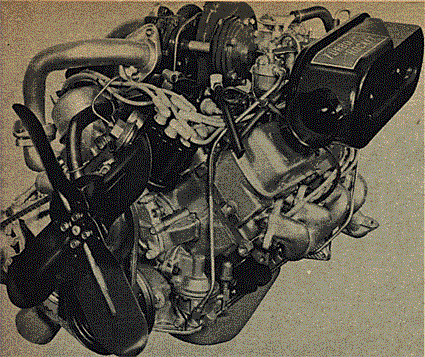 In my opinion, though the 215-cubic-inch aluminum engines could have used larger valves and ports. There was room. The stock 1.50-inch intakes and 1.31 exhausts weren't so bad with 215 inches of displacement; but they can';t fee big bores and strokes. For instances, you can bore these engines 1/16 inch (not more that that because of the cast iron cylinder liners), and stroke can be increased 5/8 inch by the welding method. This would give 273 cubic inches. At this size you would need to use at least 3/16 larger intake valves and 1/8 larger exhausts to do the job. In this case I could see 300 hp on gas. Alky should give another 10 percent (330hp). This would be about it without going to nitro fuels. Undoubtedly the new cast iron 300-cubic-inch Buick version of the basic design will have more potential. Stock valves and ports are larger, and the bigger block and crank should allow displacements well over 350 inches. Time sill tell onthis...but there is doubt that the horsepower and torque per pound will be just about the best in the country. The situation on availability of these small aluminum V8's is so-so. There aren't too many in the scrap yards yet, and those that are there are going at premium prices. You'd be luck to get a complete engine, in good shape, for less than $400. And the situation isn't likely to get much better in the future. The aluminum blocks are now out of production, and there never were too many of them produced - comparatively speaking. They will continue to pull premium prices for years. But production rates on the new iron-block version will be higher (since it's used in the LeSabre series), so I'm thinking this will gradually replace the all-aluminum 215 engines in the hot car field. They weigh very little more, they have lots more cubes, and larger ports and valves. A lot of guys will be tempted to drop their plans for the aluminum 215, and go for the iron-aluminum 300 - especially as many parts are interchangeable, and you would be able to use old junkyard parts on the new engine. We'll see. Oldsmobile's famous turbo-supercharged version of the small 215 inch aluminum V8. It developed 215 hp at 4600 rpm, gave excellent response and mid-range torque (302 lbs/ft), featured automatic waste-gas system in the unit's exhaust ducting. 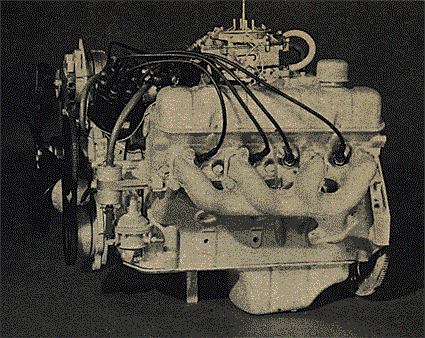 New 1964 300 cubic inch version of the small Buick V8, with new cast iron block. This engine still uses the original aluminum heads and intake manifold, weighs only 84 pounds more than all-aluminum engine. Gets up to 250 hp with 4-bbl carb. Aluminum parts still retained on 1964 Buick 300 inch engine, using much of the tooling for the 1961 Buick aluminum engine.